결핵입니다. 결핵성 장염과 결핵성 복막염이 함께 있는 경우입니다. 결핵성 복막염은 제가 junior staff일 때 관심을 가졌던 질병 중 하나입니다. 암으로 생각하였다가 결핵으로 진단되어 완치되는 happy story이므로 의사로서 행복한 경험이 많았습니다. 짧은 논문도 썼습니다. 결핵성 복막염 환자의 serum CA-125는 상당히 높을 수 있습니다. 저희 병원에서 결핵성 복막염 환자 48명의 serum CA-125를 조사해 본 바 4명에서 1,000 이상이었습니다. 그 중에서 가장 높았던 경우는 CA-125가 2,702인 여성이었습니다. 제가 환자에게 몇 가지를 물어보고 (기침한 적은 없는지, 발열은 없었는지 등등) 암이 아닐 수도 있다고 하면 환자, 보호자 모두 깜짝 놀란 표정을 짓습니다. 사기꾼 보는 것과 같은 눈초리로 째래보는 분도 계셨습니다. 반대로 무슨 구세주를 만난 것 같은 기분이었다고 말한 환자도 있었습니다. 여하튼 죽을 뻔 하다가 살아난 경우입니다. CA-125가 높다고 모두 암은 아닙니다. 지금까지 삼성서울병원에서 경험하였던 결핵성 복막염 48예를 분석하여 짧은 글로 만들어 Yonsei Medical Journal에 Clinical Significance of Serum CA-125 in Korean Females with Ascites라는 제목으로 기고하였습니다. Purpose: Mycobacterium tuberculosis is endemic in Korea. Because tuberculous peritonitis is characterized by ascites, abdominal pain, abdominal mass and elevation of serum CA-125, it can be confused with ovarian malignancies. The aim of this study was to evaluate the significance of serum CA-125 level in the differential diagnosis of tuberculous peritonitis and ovarian malignancy in a Mycobacterium tuberculosis-endemic area. Materials and Methods: The medical records of patients diagnosed with tuberculous peritonitis (n=48) or epithelial ovarian malignancy (n=370) at Samsung Medical Center from January 2000 to October 2009 were retrospectively reviewed. Results: Median serum CA-125 level in the epithelial ovarian cancer group was significantly higher than that in the tuberculous peritonitis group (p≤0.01). Only one patient (2.1%) in the tuberculous peritonitis group had a serum CA-125 level over 2000 U/mL. However, 109 patients (29.5%) in the epithelial ovarian cancer group had a serum CA-125 level over 2000 U/mL. 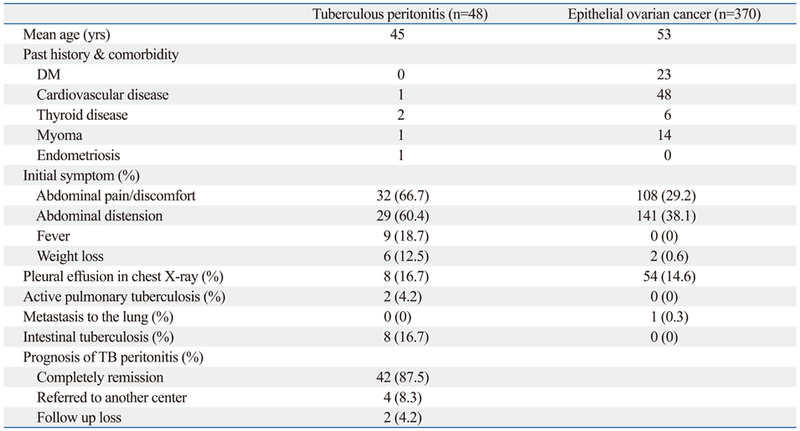 At the CA-125 ranges of 400 to 599 and 600 to 799, the proportions of those with tuberculous peritonitis were 24% and 21.9%, respectively. At a serum CA-125 level over 1000 U/mL, however, the proportion of tuberculous peritonitis was much lower (2.1%). Conclusion: Tuberculous peritonitis should be considered in the evaluation of female patients with ascites and high serum CA-125. 혈청 CA-125의 분포입니다. 결핵성 복막염에서는 어제의 증례가 가장 높아 2,702였습니다. 그러나 1,000 이상이면 대부분 난소암이었습니다. 난소암에서 평균 CA-125치는 1,002였고 결핵성 복막염에서는 418이었습니다. CA-125 영역별 결핵성 복막염의 분포입니다. 예를 들어서 500 정도면 약 25%는 결핵성 복막염이었습니다. 조직으로 확인된 전형적인 결핵성 복막염의 증례입니다. Fig. 5. A case of tuberculous peritonitis. (A) A 68-year old woman came to the hospital with abdominal distention which developed 2 months prior. CT scan was taken and the first impression was peritoneal carcinomatosis. (B) Laparoscopy was done and the histology showed chronic granulomatous inflammation with multinucleated giant cells. 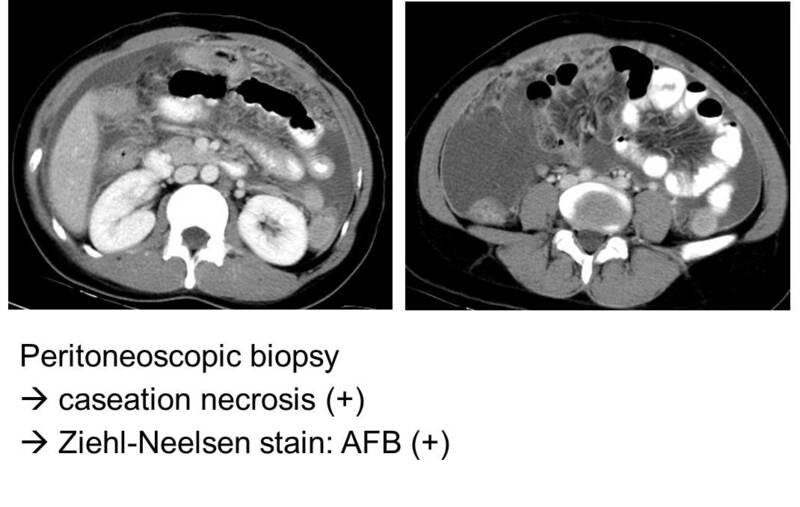 (C) No ascites were seen at the follow-up CT scan, 4 months after taking anti-Mycobacterium medication.